A random glance inside a cafe window reveals Pinoy delights hiding in plain sight in the heart of Bondi Junction. Sometimes catching buses around Sydney has it's own little reward. 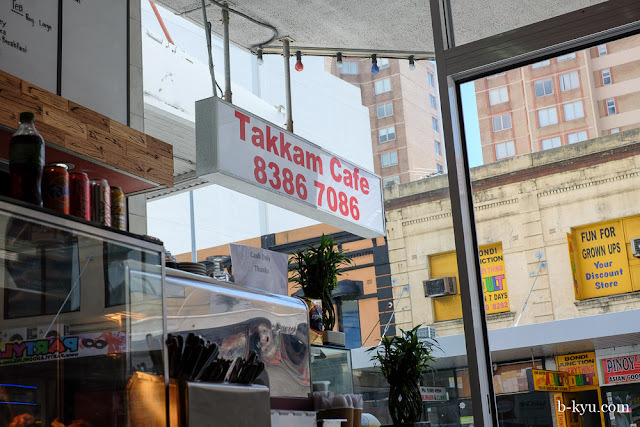 While waiting patiently for a bus into the city from Bondi Junction, we stood in front of Takkam Cafe and checked the menu on the board. Nothing too exciting there. 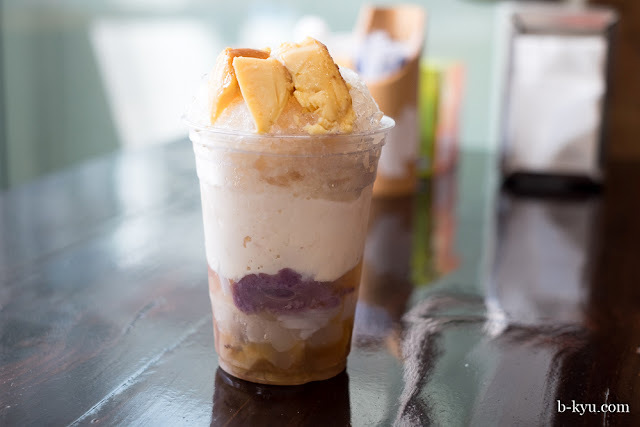 But peering into the front cabinet, Alison spies small pieces of flan, coconut balls and beans that suspiciously look like the fixings for halo-halo. At the same time, Shawn peers closer inside at the bain-marie-of-love and notices some good looking food ready to go. Then it clicks. "Are you guys doing Filipino dishes?" he asks. "Yes! Do you like dinuguan? You know, the dish with blood?" "Oh yeah, we sure do. We'll be back soon". And so we rode off on our bus, only to return a week later hungry and ready to dig in. 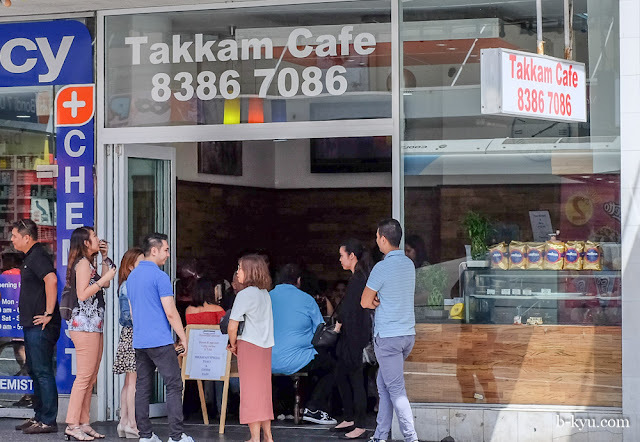 Takkam Cafe is one of those hybrid standard cafes that turns into a community centre on weekends, with folks dropping in, chatting and getting takeaways of their favourite dishes from home. It's often filled with families getting plates of food and sharing or workers from Westfields having a quick feed or sweet treat before hitting the shop grindstone. 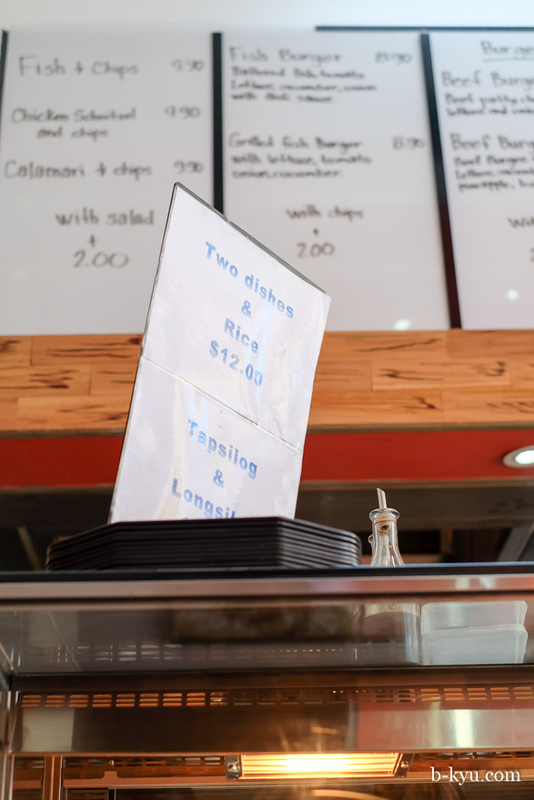 There's a few signs on the counter that let you know the deal for the Filipino food offerings. In the morning on offer are tapsilog and longsilog, classic breakfast dishes. Around midday the metal trays start to get filled with a variety of ready made dishes to choose from. Hunks of crisp pata (pigs knuckles deep fried whole) are ready to be carved up, pancit (fried noodles), grilled bananas on skewers, longsilog (sausages) wait patiently to be picked. 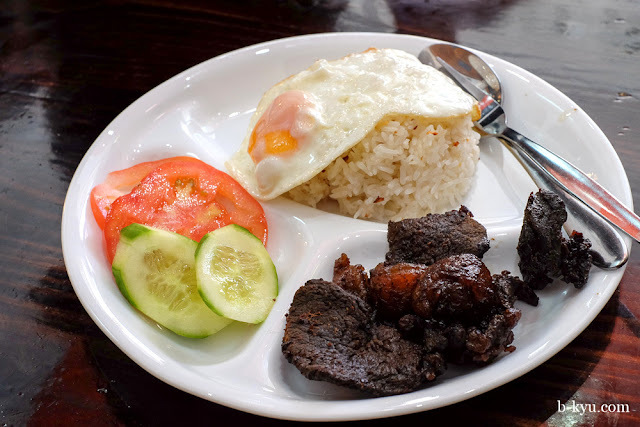 Tapsilog ($11) is a breakfast dish of beef slow cooked in soy until slightly dry, served with garlic rice, fried egg and a serve of fragrant fruity vinegar. The meat might look dried up and chewy but its softer to the bite than it appears and darn tasty to boot. They serve this and a longsilog version for breakfast in the morning. Two choices withe rice $12.50. 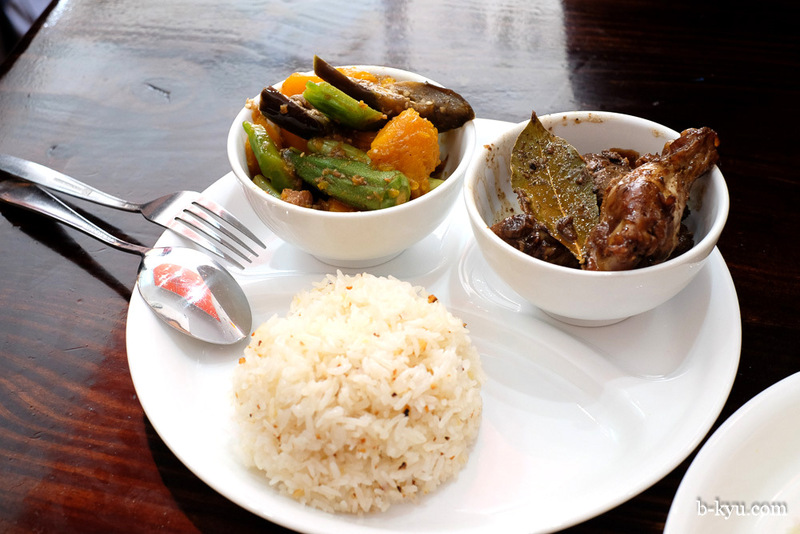 Pinakbet, a mix of vegetables and shrimp sauce and chicken and chicken livers in an adobo type sauce. Pinakbet is one of our favourites, loads of veggie goodness. The chicken livers weren't too strong, they are a nice counter to the vegetables. Garlic rice on the side, you might need to specially request it. All of the side dishes are served in little bowls which makes it easy to share if you want to get more than two choices. Cassava cake and Ginataang. The cassava cake had a surprise rich fruity sweetness reminding Shawn, oddly enough, of his auntie's traditional Christmas pudding, a bit amazing. Ginataang is a warm coconut soup with banana and rice balls, some with ube flavouring (the bright purple bulbs). A really sweet dish. Mr Shawn stops in for quick mid-week $12.50 dual raid on the bainmarie-of-love. The sisig salad (right) is sensational - pork and super crunchy crackling chopped up and made all fresh and lively with chopped peppers, onion, (we guess) lime, garlic and soy (?). The mix of fat, fresh, lime and crunch is Surry Hills-worthy (halve the serve, stick it on one of those stingy sharing plates, charge a lobster). 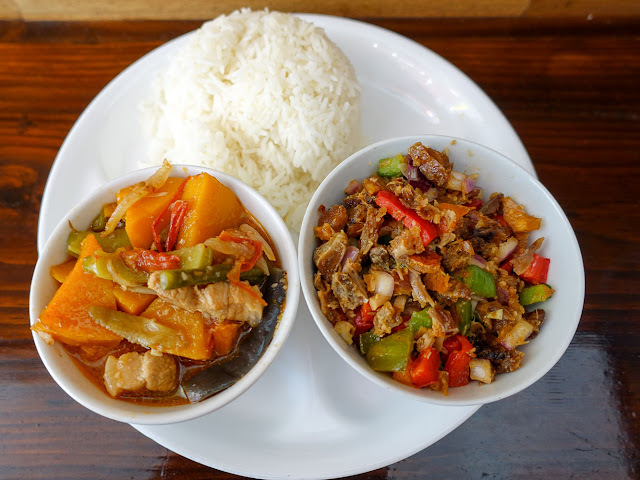 On the left is pinakbet - loads of veggies to counter the sisig, with a little pork belly for good measure. The cafe is light and airy inside, opened up to the street. Fun for grown ups. 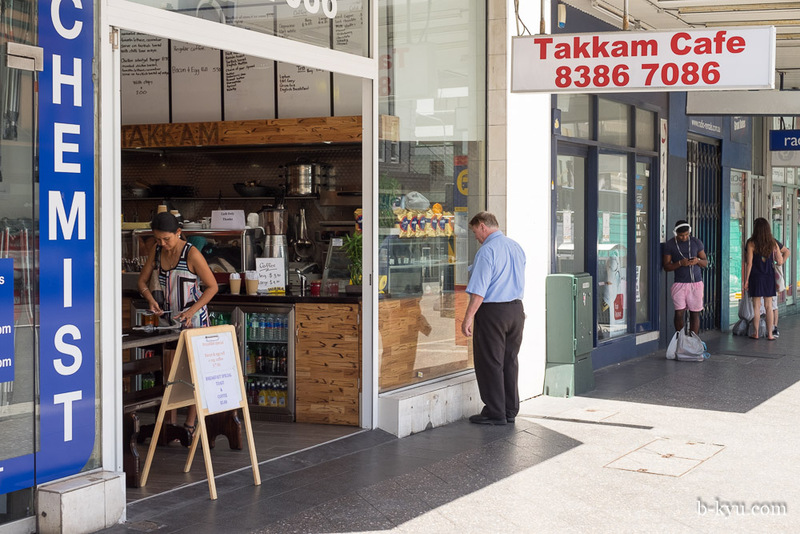 Takkam Cafe is at 119 Oxford Street, Bondi Junction. Ph: 8386 7086. Across the road is the Filipino grocery store Pinoy 'To Atbp so you can stock up on pork rinds, bagoong and ube ice cream. The place can get a little busy if a crowd arrives, it was packed out on occasions we passed by. 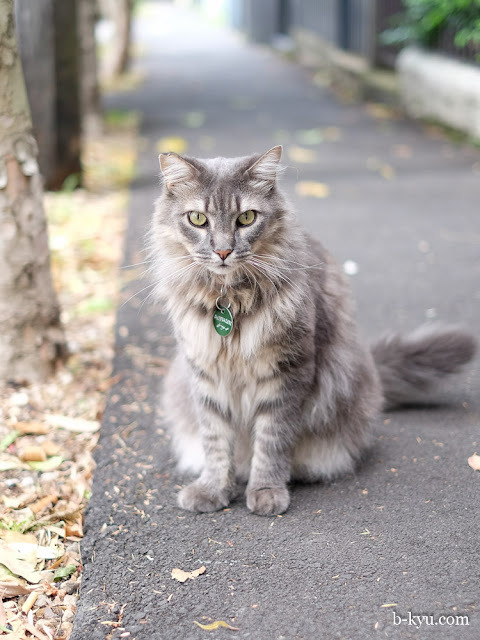 This post is brought to you by Jasper J Pussycat, the friendliest, fuzziest cat in all of Ferndale Street. Hooray - you found this place! I just discovered it last week, walked past at 5pm and it was packed with Filipinos. Haven't eaten there yet, looks like tapsilog for brekky is the go! We're glad too! The word is out on this place in the Filipino community that's for sure. It was often really busy the few times we walked by, so hope you get a seat.